As world leaders prepare to depart from Davos, here at Hammer we’re always looking for our next excursion! After the huge success of our visit to Amsterdam last Summer, plans are being laid for a trip across the Irish Sea to visit Cork! Get Ready to be Corked! Yes, the Hammer crew – like a dodgy bottle of Chateau Rothschild – are going to be Corked! The 2018 Hammer on Tour is now confirmed. On the weekend of June 8-10 Hammer are taking on the might of Cork Chess Club in the second city of Ireland. 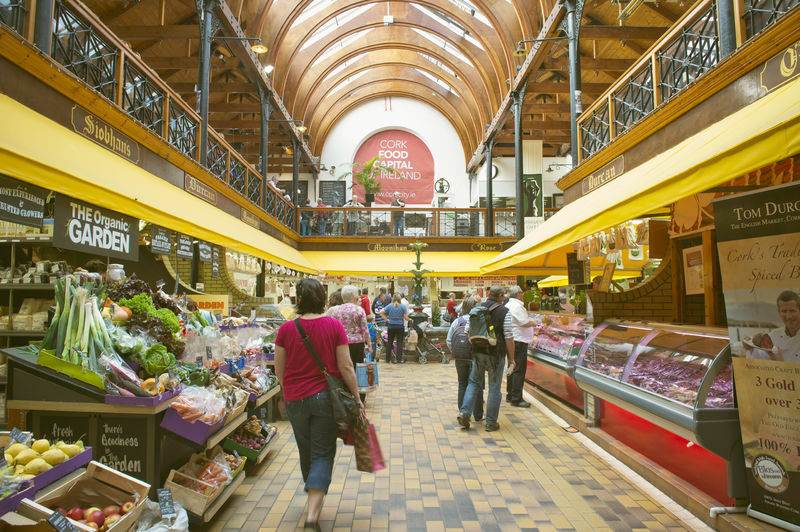 In a weekend that will celebrate chess, beer, camaraderie and sampling the delights of the beautiful city of Cork. Following on from our enormously enjoyable and most excellent weekend in Amsterdam in 2017, we have decided to grace the Emerald Isle with our presence. How magnanimous we are!! 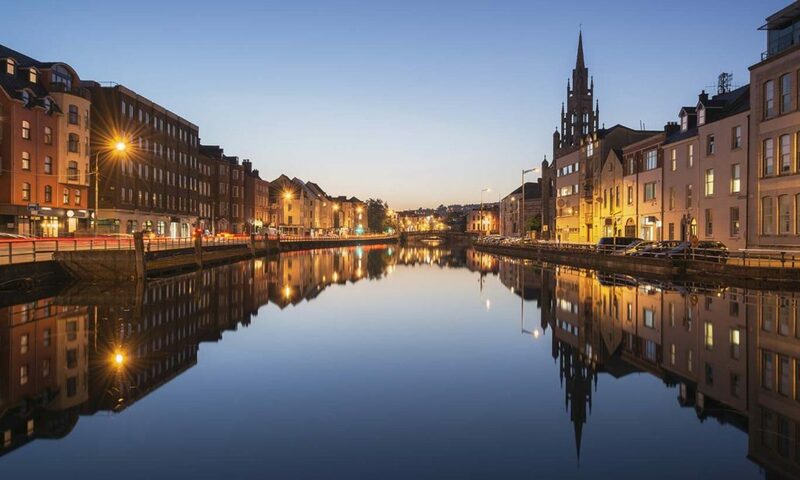 Cork is a beautiful city situated on the River Lee in the stunning South-West of Ireland. It has a huge history, with us – the Brits – the noisy and repressive neighbours, playing a large part in that. So, it is time to pack your bags and book your flights (I have already done so!). The flights are excellent value at the moment. Please email John White (john.white49@ntlworld.com) ASAP confirming your participation so we can start assembling numbers and looking at accommodation. Plus, we need to give the numbers to our hosts so the arrangements can be put in place. This will be a superb weekend, so do not miss out! 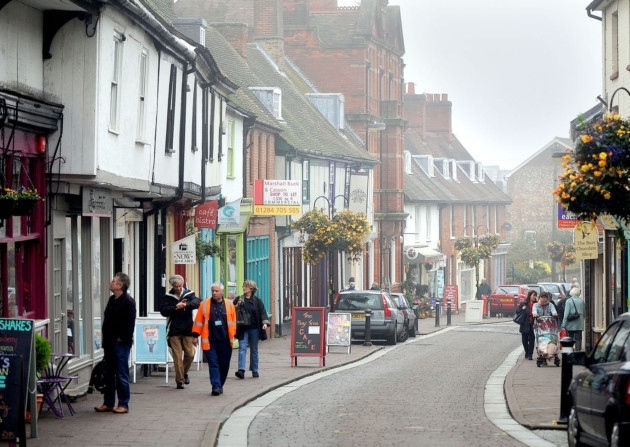 Bury St Edmunds is a beautiful Suffolk market town with a history dating back to the 11th Century, and a fine cathedral. The centre-piece of the day will be a long-play over-the-board mass-team match, so we need as many Hammerites to step up and defend the honour of our club! It will be an excellent day of chess, making new friends and perhaps best of all the prospect of sampling the beer at the Old Cannon Brewery and the Nutshell. I already have commitments from Carsten, Bajrush, Marios, Wyatt, Adam and Chris Skulte. So, guys I need you step up. Email me ASAP – john.white49@ntlworld.com – so I can match you with a suitable opponent. This is new territory for Hammer, but hopefully it will become an annual event in the calendar. Our honour must and will be defended. Go Hammer! Welcome to part 4 of the Starship Hammer One 2018 odyssey, and its one season mission to boldly go to Division Two of the London League. Captain Clueless Log – Part Date 22.01.2018 – Hammer 1’s crew have beamed down to the planet of literary and scientific study – Athenaeum. A strange and hostile world, where gaining entry to the match venue requires digital input technology. The Hammer Landing Party consisted of, in board order: Thomas, Marios, Bajrush, Jim, Paul McK, Chris S, Sheikh, Tommaso, Paul K and Clueless. Even with the inclusion of Clueless, the strongest team Hammer 1 has put out i the London League for many a year. We out-graded our opponents on average by 20 points a board. Thus, applying Spock logic – the result should not have been in doubt. If only life was that simple! Captain Clueless also cocked up on the logistical front and got the wrong start time. Basically gifting at least 10 minutes to some of the Athenaeum team. Chris S got delayed but brought John G (Sauvignon) along, and poor Bajrush arrived too late. Fortunately, John G stepped in and took over board three for the Hammer crew. Default-free we remain. So, to the tale of a much fraught and difficult evening. Playing black on board one and making his debut in the London League, Thomas (T-Bone) took on an opponent who clearly wanted a draw. Displaying great patience and tenacity, Thomas probed, created problems and worried his opponent on the clock. On a blitz-style finish he broke through and downed his opponent. A victory for sheer willpower. Hammer at 1-0. On board two Marios (Zeus) has adjourned in a position where he has a slight advantage. I have to say his determination to carry on and grab the full point at the conclusion of the evening was truly awe-inspiring. There is nothing like an ultra-determined Greek with immortal characteristics! Jim (Loco) had one of those games that saw little happening and is adjourned in a position with a setup of Rook and three pawns, vs Rook and four pawns. He has three pawns. His King is cramped but he is convinced he can hold the position. I do not think this is Celtic wistfulness. Board 5 saw Paul McK (The Prof) have the game of the evening with the black pieces. I have asked him to annotate it for the website. This game had everything – piece sacrifices, a king march-up the board in search of safety, and finally a two Rooks vs Queen endgame. Paul deployed all his ingenuity and experience to keep the game alive – including excellent reverse psychology. The strategic offer of a draw when you are the one being battered! Suffice it to say, in the end all came good and he made it 2-1 to Hammer. On board 6 – Chris (Sydney) had one of those nights when you are in a bad vein of form. He missed a forced checkmate win and in the end had to resign. He was so angry with himself and cursing his luck. This was an aberration & he will recover his best form – he is too good a player. Board 7 saw Sheikh (Pandit) with the black pieces, establish equality early on. He was cruising to a draw at worse when it all went wrong and he allowed a Rook and Knight corner checkmate. He was at a loss to explain it in the pub afterwards and his form this season has been good. Personally, I blame the venue. Hammer now down 3-2. Paul K (Dead-Eye) is in lethal form this season for Hammer in LL3. He recored his third win in a fine tactical game. He really is on fire. Hammer now edging at 4-3. Finally, to Clueless on Board 10 a list-minute substitute for The Suit (Matteo) who succumbed to the Aussie/Japanese flu virus. To be honest with you I played poorly. My form is uncertain at the moment and I was lucky to find a tactic to force a draw. Hammer at 4.5-3.5 on the night. So not a disaster, but to be honest we are a better team than the score suggests. We now need to refocus and put this behind us. Promotion is our goal and games like this remind us that we have to work for it. Hammersmith 2 entered the second half of the season knowing that a good run of results would see us promoted to Division 2. It was vital to get a good start in a tough encounter at Hendon. John Ryan won a pawn early on and exchanged pieces off into a tricky queen and pawn endgame. John’s infamous endgame technique shone through – he coolly navigated perpetual check threats and gradually pushed his pawn until it was unstoppable, forcing resignation. 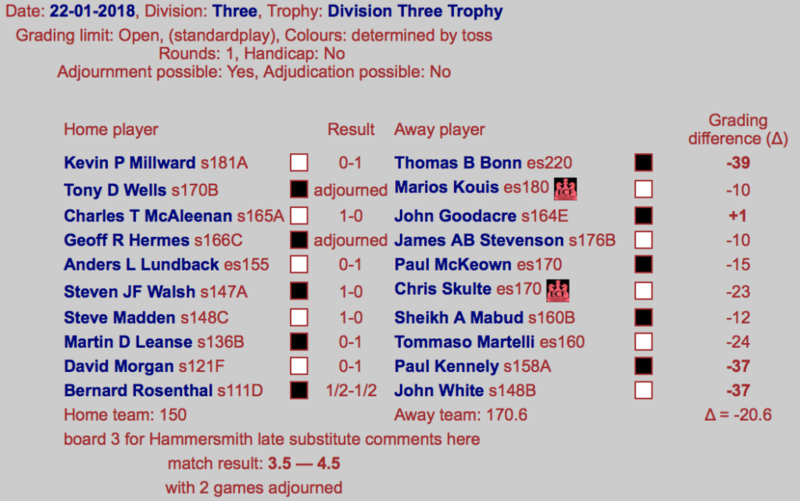 The match was level at 2.5-2.5, and John’s record for the team improves to an impressive 3.5/4. Dan on board 8 opted to delay his development to pick up material early on. His opponent couldn’t find a way to exploit his weak king – Dan consolidated and picked up the win. So in the end it was a 5.5-2.5 win to Hammersmith – a relief to score a win after two 4-4 draws. Well played all! Awesome update. (As usual). I love this club.